Security+ 2.0 safeguards your household, with every click a new code is sent to the garage door opener so that the door opens only for you. PosiLock® locks down your door by electronically monitoring against a forced opening. 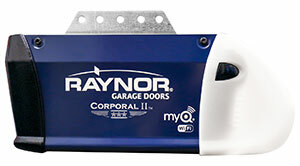 Opens and closes multiple doors and turns garage door lights on and off from inside the garage. It locks out radio signals while you're away with multi-frequency Security+ 2.0™ technology. It also allows for fast, easy programming of accessories with the new learn button. This powerful multi-door control can operate up to three garage doors, gates or MyQ-enabled lighting accessories. Plus, multi-frequency Security+ 2.0™ technology virtually eliminates radio wave interference. This feature makes it nearly impossible for burglars to capture your transmitter code.